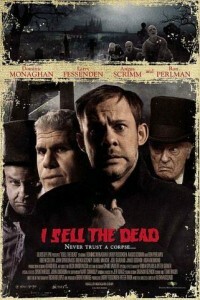 In the movie “I Sell The Dead,” 19th century justice has finally caught up with two of the craftiest grave robbers in town. With only a few hours to go before his date with the guillotine, body-snatcher Arthur Blake (Dominic Monaghan / “Lord of the Rings,” “Lost”) tells his life story to the peculiar Father Francis Duffy (Ron Perlman / “Hellboy,” “The City of Lost Children”). Before long, Arthur spills the beans on how he got started in the grim corpse peddling business with seasoned ghoul Willie Grimes (Larry Fessenden / “Wendigo,” “The Last Winter,” “Habit”). As the whisky flows Arthur’s tales get stranger and stranger. From their graveyard discoveries of vampires and zombies to tales of vicious gang rivalries with the infamous House of Murphy, Arthur’s confessions are the stuff of legend! Whether pillaging in fog drenched grave yards or plotting on blood soaked coast lines, Grimes and Blake leave no graves unturned. Their colorful and peculiar history is one filled with adventure, horror, and mayhem that threaten to drag all involved down into the very graves they’re trying to pilfer.